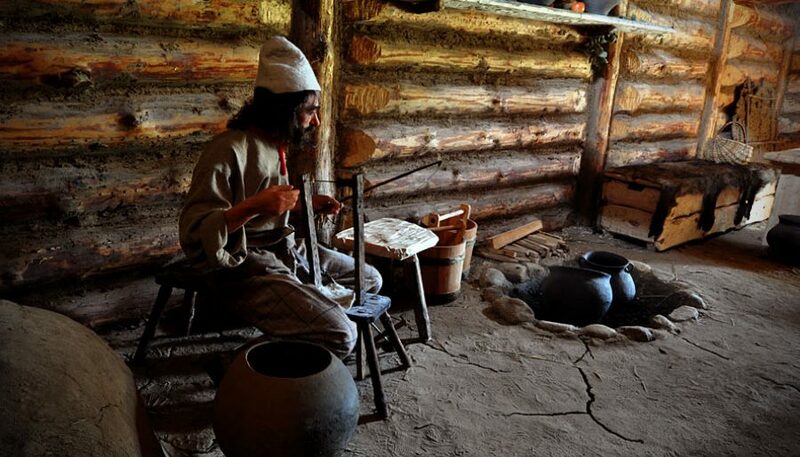 The Amber Craftman Hut is a reconstruction of his workshop. It presents tools he used, and items that came out his hand. During archaeological excavations conducted in the area of Pruszcz Gdański, there were found a lot of beautiful amber jewellery, reflecting the extraordinary capacity of local amber craftsmen. Inside, the building is divided into two rooms, with the wall made of plaits. Just at the entrance you can see his tools: turning lathe, knives, files, flint blades, stone board for smoothing, gimlet drilling, felt and leather of a deer to the final smoothing and others. On the left there is a cave for resources – a kind of a primitive serving pantry for food storage, grains, etc. A similar cavity is also outside of the building, in this case acting as a household cellar. Behind the wicker wall there is a reconstruction of a vertical loom. Moreover, there is a fireplace and dome stove, made of clay and branches, dug in the ground.